Jermaine Chandra is a creative London based Wedding Photographer who offers a vibrant and modern approach to wedding photography for both national and international assignments. Asian Wedding Photographer – which one is right for you? Asian Wedding Venues – Which are the most popular? Dharshika and Madura’s wonderful Tamil wedding was certainly one to remember. Full of colour and attention to detail, it was a delight to provide their Tamil wedding photography. The day itself was held at Parklands, Quendon Hall and was a fitting venue to host such an event. Quendon Hall sits on the Hertfordshire border and provides a beautiful picturesque setting for weddings. It has won many awards and is offered exclusively to the wedding party for the day. This arrangement really allowed Dharshika and Madu the freedom to truly customise their day. The beautiful light that the marquee showcased would ensure that the Tamil wedding photography would be a joy to capture. As with most Tamil celebrations it was an early start to the day. The groom made his entrance into the venue alongside his brother-in-law amongst a cheering crowd. Once the morning groom rituals had completed, it was time for Dharshika to make her entrance. The crowd waited eagerly in anticipation. Her bridesmaids led the way towards the stage all sporting beautifully coloured saris. The ceremony culminated with the tying of the Thaali, the most auspicious moment of all Tamil Hindu wedding events. My heart begins to race with adrenalin at this point in anticipation of capturing such a beautiful moment. Needless to say that it was – it was a great day! It was clear to see that these two had a great connection. I always endeavour to convey that through the images I take. The time we spent together during our couple shoot provided some quiet time away from the festivities. It was a chance for us to build on what we had learnt during our pre-shoot to obtain some beautiful portraits. 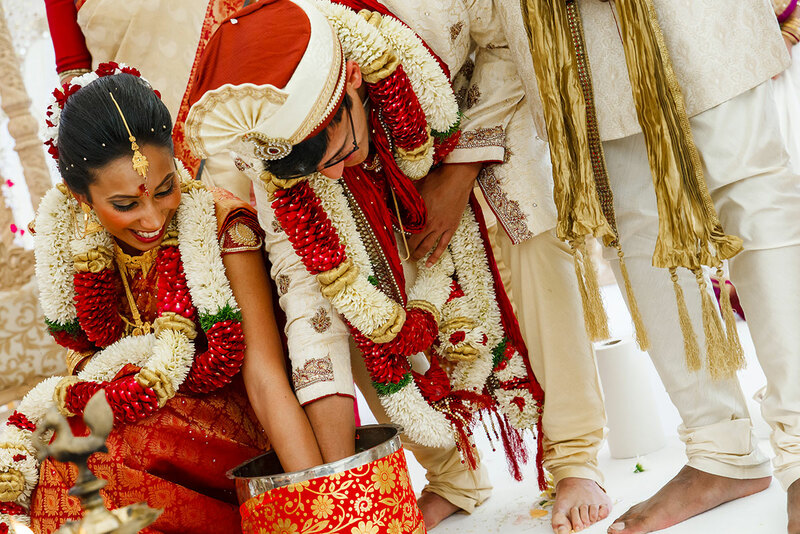 Tamil Hindu weddings typically have a lot of sequences involved within the ceremony, but both Dharshika and Madura took to it all so naturally. It was a pleasure to document their colourful event and provide my Tamil wedding photography services. Below are some of my favourites taken on the day. I hope you enjoy the highlights. If you share the same high regard for timeless moments being captured in the most creative of ways then I would love to hear from you. Do feel free to contact me on info@jermainechandra.com or call on +44 (0) 7835 58 22 58. I look forward to hearing more about your Tamil wedding photography plans. I’m liking this mate, great work Jermaine! Wonderful wedding Photographs. Nice couples and awesome colors. Thank you so much Jermaine! The photos are amazing! You captured some really good moments, like when I looked in the mirror and discovered the mess Madu had made when putting on my pottu 🙂 Can’t wait to see some of the ones from day 2 now! Thanks Jermaine! Very happy with this – looking forward to seeing the others! Happy to say that I am currently working on this for you. I will be in touch when they are ready. Copyright © 2019 Jermaine Chandra | Asian wedding photography by Indian and Tamil wedding photographer Jermaine Chandra. All Rights Reserved.